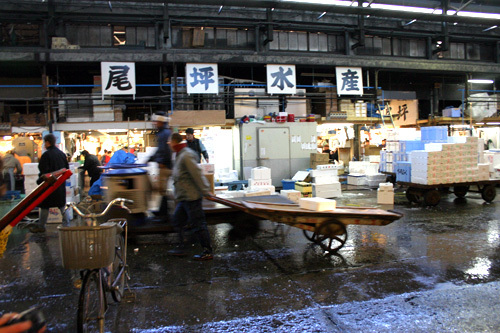 Tokyo has an awesome tourist attraction for those suffering from jet lag – Tokyo Metropolitan Central Wholesale Market aka Tsukiji fish market. New York’s Fulton Fish Market used to be a similar tourist attraction, but now it moved to South Bronx, and I am not even sure if it’s still open to the public. 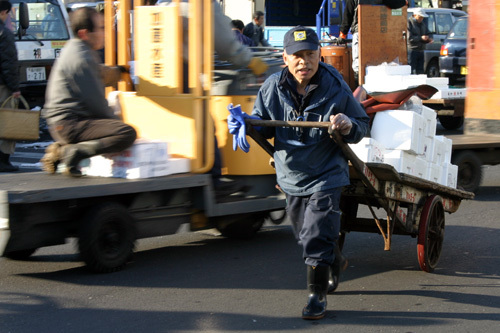 Basically Tsukiji is a labyrinth of hangar-sized buildings and outside stalls surrounded by a sea of traffic. 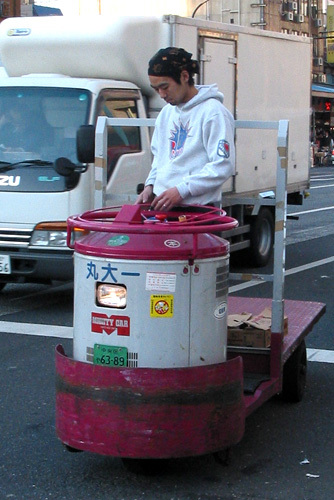 You are surrounded by running people, zipping bikes, scooters, trucks, forklifts and funny little vehicles propelled by a gas-burning engine of some sort. Some prefere a more old-fashioned method of transport. 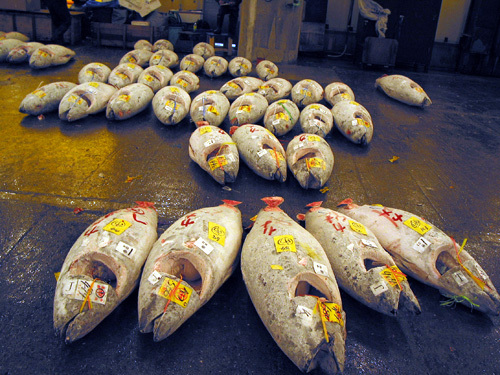 The heart of the market is the famous tuna auction, where buyers bid on giant frozen tuna carcasses. We arrived after it was already over. Sadly, the auctions were closed to the public in 2005, so it seems I missed my chance to see it. I did get to see the aftermath of the auction – floor littered with 300-500 pound frozen fish that fetch about $20/lb (wholesale). 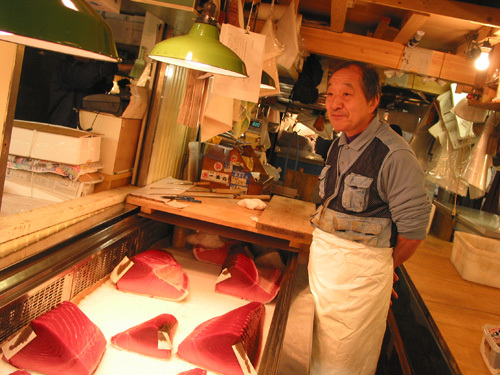 I guess there’s a few hundred thousand dollars worth of sashimi in this picture here. 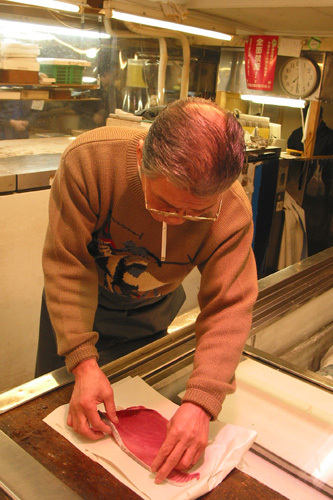 and taken to be cut up. 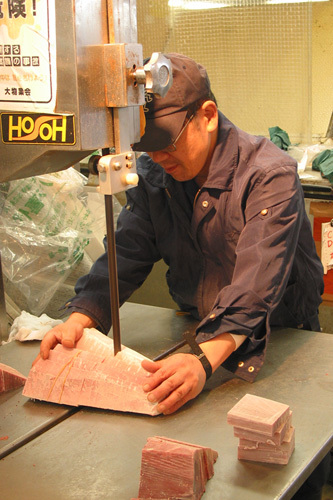 They are frozen solid, so they can use woodworking saws to cut them up into blocks. 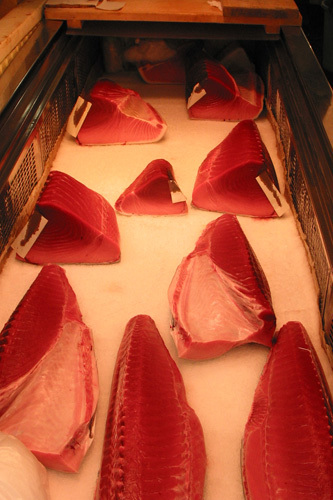 Once thawed, tuna looks much more appetizing. 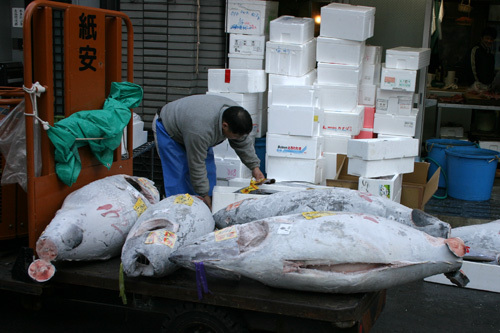 In fact, big chunks look like giant rubies. Even the smaller pieces get special treatment.